Available in sizes 2-18W and Custom Size, this sequin bridesmaid dress dress is flattering for any silhouette. Your bridesmaids can dance the night away with you in comfort and modesty, while matching the elegance and style of your dream wedding. For the truly glamourous bride, even their bridesmaids sparkle. 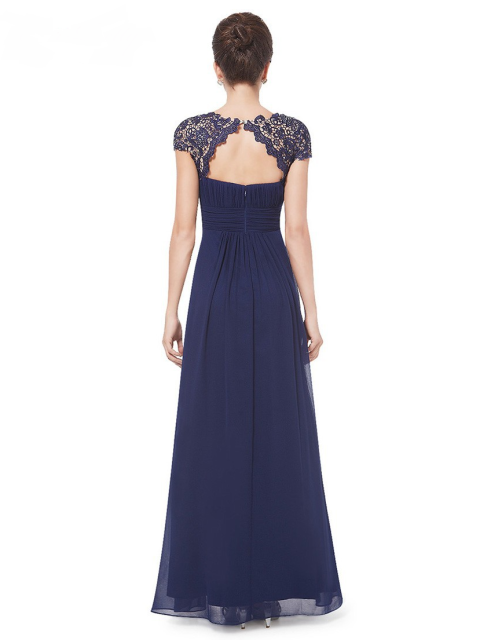 This floor-length, sleeveless A-line is perfect for an evening event with an upscale flair. The scoop neck, tank style top featuring gold sequins adds an elegant and modern touch. While the floor-length pleated chiffon softens the look and adds romance. The drama of a floor length bridesmaids dress is not to be underestimated and gold is one of this years hottest styles. Your favorite ladies will feel like a million bucks in this sparkling gown. The backless design increases the dramatic statement and ups the glamour level, while the built-in bra makes the whole thing practical. Details like the gold sequins wrapping around the back belt area, at a natural waist, and wide chiffon straps tie the look together. Imagine your bridesmaids floating down the aisle in a cloud of chiffon, the gold offset with a smart black tuxedo at her side. Their sparkle will only be outshone by your radiance. Together, you and your best friends will embody the sophisticated style that perfectly reflects you and your mister. For a wedding palette that includes gold, this gown is the perfect bridesmaids dress. The splendor and chic styling is just right for the modern bride. Order this sequin bridesmaid dress while it lasts. It is a great deal that needs very little accessory, as it speaks for itself. Let your bridesmaids shine and glitter, as perfect statuesque models at your side. The Charming Chiffon with Sequined Top is where comfort meets glamour. Don’t miss this floor-length sleeveless A-line with a scoop neck, chiffon pleated bottom and gold sequined top. 5 out of 5	Exactly what I expected! I am so pleased with my purchase! The dress looks exactly like the images and it was delivered in a timely manner. I am 5’7″ and will need to get taken up a bit, but other than that this dress fits true to size. The built in bra/cups are perfect, too! They look natural – not a weird shape like some. I am very, very pleased and so excited to wear this for my friend’s wedding! Is there a list of colors for the skirt that you have available? After the 15 days to process how long does it take to actually ship!! 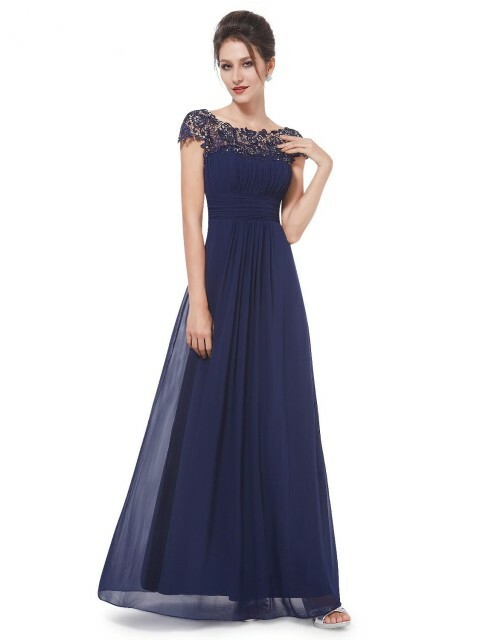 I want this dress for a bridesmaid dress for a wedding I am in July 23 in Idaho! Do you think it could be here a little before then since I think I will have to alter he bottom since I am fairly short! 15 days to process is a maximum time. You will have a dress within 15-20 days at home. Looks exactly like the photos, very happy with this purchase! Does this dress run true to size? I’m inbetween a 2 and a 4 and sometimes I wear a 2 and sometimes a 4.. I normally wear a US size 2. My measurements are 33″ bust and 26″ waist. I don’t see a size 2 on the chart. Does this dress run small? Was wondering if I need to order a size 4 instead. Thanks! I’m usually wear a US size 4, but according to your size chart I am a US size 6. How long is the turn around if the dress were not to fit? We can prepare a custom-size dress for you (no additional cost). Contact with us. Can you do sequin white top and chiffon white bottom? Getting married in August of 2017. I picked these as my bridesmaid dresses. I was very nervous about ordering as I wasn’t sure how legit this site was. The dress came exactly as pictured. 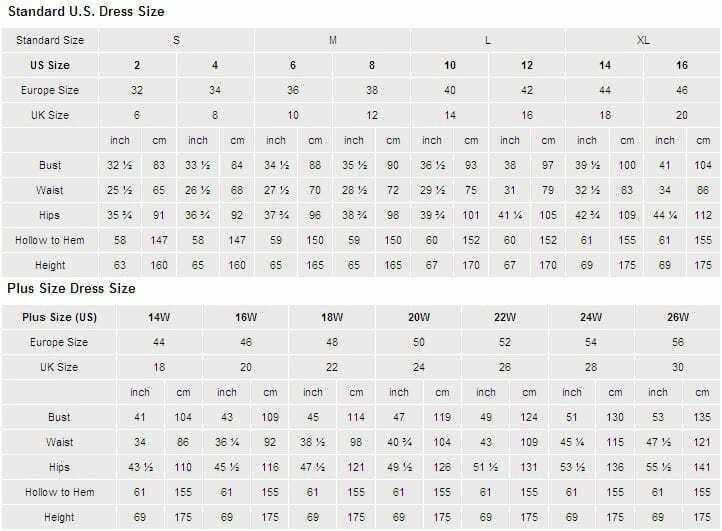 Dress measurements were true to size chart. Quality is outstanding. I live in U.S. and it took the dress a little bit over a month to get here but so worth the wait! Hope this helps! I ordered a couple of these to make sure they are as beautiful and romantic in person…and they are! I have 10 bridesmaids and I am looking forward to seeing all of them in his dress! Great Customer Service thus far. One of my girls will be pregnant so she is going to work with them on special sizing. Thanks! the dress visually looks just like the picture which is good. The dress is very long. I am 5’5″ and will have to have about 5 inches taken off, I do plan to wear flats at the wedding, i’m sure if I was wearing heels the length wouldn’t be too much of an issue. I am in my best friends wedding coming up, all the bridesmaids can choose their dress it just has to follow the brides “guidelines” of color. Most of the bridesmaids have gold sequin in their dresses. I have been looking for a while for a dress with some gold sequin that I love, I found this dress and fell in love. However, the bride loves the dress but thinks the bottom half may be a little too white/ivory at the bottom. I have continued to look around but i keep coming back to this dress, is there any way you do custom changes to the color of the bottom of the dress? If possible I was thinking the color “champagne”, so just a few shades darker. This dress looks almost exactly like the photos. The sequins are more of a yellow-gold in person though. The skirt is 3 layers of fabric. The shoulder straps match the color of the skirt. I suggest ordering the size closest to your normal size and have the dress altered when you receive it. I had mine made to size and the bodice was a little off. The sequins also rubbed my neck and shoulders a little too much and made my skin red. Otherwise, it’s a great dress. I live in Canada- do you ship here? If so what is the cost?! Second question- what is your return or exchange policy? Yes, we ship to Canada. Delivery is free. We want to give you a hassle-free way to return anything, so you can return any item to us within 15 days of receiving your original order, including sale items. Is it possible to have navy chiffon on the bottom? Do you take returns of the dress does not fit? If so do you charge return shipping? Can you make this dress with a closed back? We ship all over the world. In UK, we use DHL. Will this dress still be available in February 2018? I would like to wear it to a wedding in April 2018 in the UK. Thanks! I was worried this would be a scam site after reading the return policy and a bunch of articles that had me in a panic while I waited for the dress to arrive. It took a month to receive the dress but it is exactly as pictured. I am only 5’1 and this dress is about a mile too long so I will have to have it altered in every way. If you’re really tall it will be perfect! 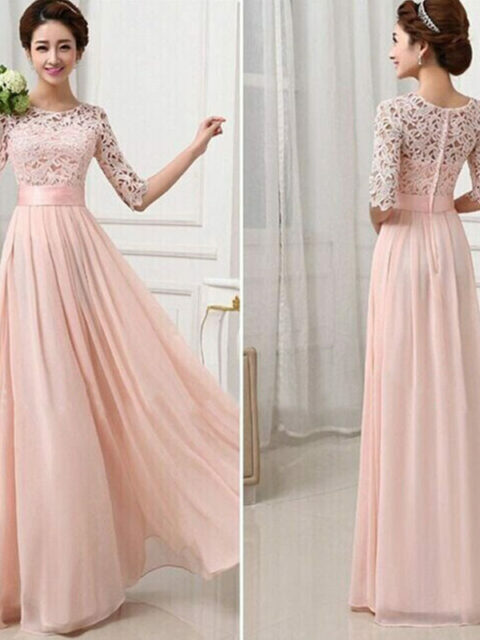 Could this dress be made in pink? Is it possible to have a back added to it (similar to the style of the front of the dress)? Do you ship to New Zealand? Could I get this dress in a gold top and a navy chiffon bottom? I am a bridesmaid and need to get a white dress. 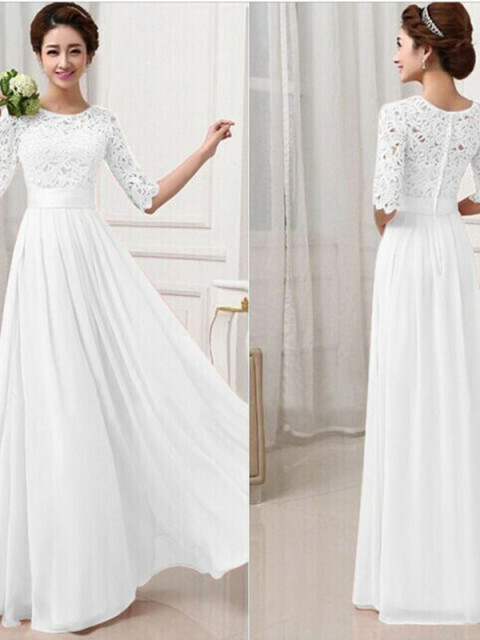 Could you possibly make this dress in all white? We can do matte ivory top and white skirt. Do you offer this dress with a different colored sequin top? I need a rose gold or champagne sequin top and a blush or champagne colored skirt. If I order today, can You guarantee I’ll have it by May 13th? One of my bridesmaids is tall (5’11”)…does this come in long, or can you make the skirt extra long so it’s not at her ankles? When you say you can do this dress in white, will the top be sequins still?